Founded in 1830, the United States Naval Observatory (USNO) is among the oldest scientific agencies in the United States. 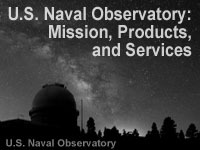 Initially tasked with restoring, repairing, and rating nautical instruments, the USNO today provides precise time and celestial measurements required for GPS, telecommunications, navigation, and other operations. Intended as an introduction to the USNO, this module examines how the Observatory goes about its mission, and briefly describes the science behind its observations and publications. Excellent module - great explanation of reference frames and importance of precise time for GPS positioning. Enjoyed the historical information as well.